The blog is also called Garden Faerie's Musings, and I've put the link here as well as in my sidebar if you want to stop over and say hello. As always, I appreciate your support. If you have a facebook account, you can leave comments directly, otherwise you'll need to create an account there (thanks for the fb update, MBT!). The most recent article is about free ideas on garden walks. Tks for the link Monica.....will pop over. You will be one busy lady! And a big CONGRATS! Good luck with your new venture, Monica! I will drop over for a visit later. Good morning, Monica. Love that you coordinate your shoes with whatever is blooming. I'll check out the site. That is great news Monica. Congrats and I hope the big bucks are rolling in! Na dann Monica... herzlichen Glückwunsch zum neuen Blog. Bin sehr gespannt, was uns dort erwartet. That's great Monica! I hope it goes well for you. 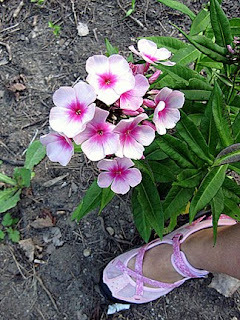 I like your shoes matching the flower. Sweet. Such cute shoes! Looking forward to reading the new blog. :) And, your old one if you ever get around to posting something. tee-hee. Again, congrats on the blog! BTW, you don't need to sign up for an account because your site allows you to comment with a Facebook account. Just something for people reading this who don't like to create accounts to keep in mind.